Report says Bedouin children killed in explosion in Negev had been playing with an IDF grenade which went off. 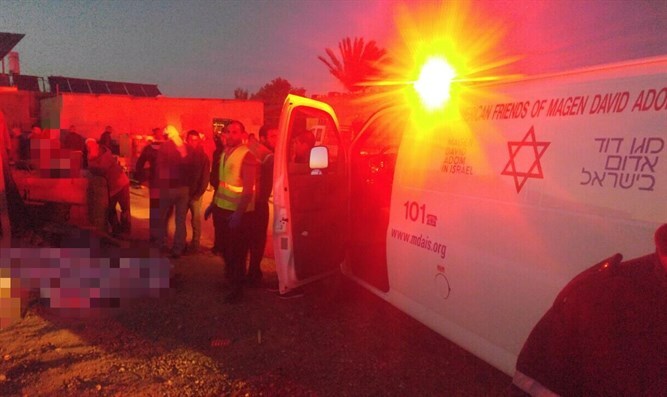 An IDF grenade is the cause of the deaths of two Bedouin children, aged 8 and 10, who were killed last night by an explosion in an illegally constructed Bedouin village near Route 25 in the Negev. Channel 2 reported that an investigation into the incident revealed that a military grenade caused an explosion. The family members of the two children complain that the army, which conducts training near the village, was negligent and did not collect all of its ammunition. A senior MDA medic, Yasser Abu Qatima, who was summoned following the report of the explosion and was the first paramedic to arrive at the scene, described what he saw. "When we arrived, the scene was very shocking. We saw two children, aged eight and ten, lying unconscious and with very severe systemic injuries. They were without signs of life and we were forced to declare them dead on the spot." A preliminary investigation into the incident determined that the children had been playing with an unexploded military ordinance when they were killed. Bedouin theft of IDF equipment and Negev farmers' livestock are a daily occurrence in the Negev. The Regavim Organization, which monitors land encroachment called on law enforcement authorities to prevent future tragedies by taking immediate action to prevent the Bedouin community from stealing munitions from IDF bases. Regavim had previously filed a petition stating that the village was built illegally on private Jewish land. Its residents, the petition states, should therefore be relocated to a legal town. However, this petition was denied by the Supreme Court. "If the residents were living in a recognized town with proper facilities, education, and law enforcement, chances are these kids would have been playing at the playground, and wouldn't have been messing around with explosives," a Regavim spokesman said.